Explanation: Leonids Meteor Shower came to an impressive crescendo in 1999. Observers in Europe saw a sharp peak in the number of meteors visible around 0210 UTC during the early morning hours of November 18. Meteor counts then exceeded 1000 per hour - the minimum needed to define a true meteor storm. At other times and from other locations around the world, observers typically reported respectable rates of between 30 and 100 meteors per hour. This photograph is a 20-minute exposure ending just before the main Leonids peak began. 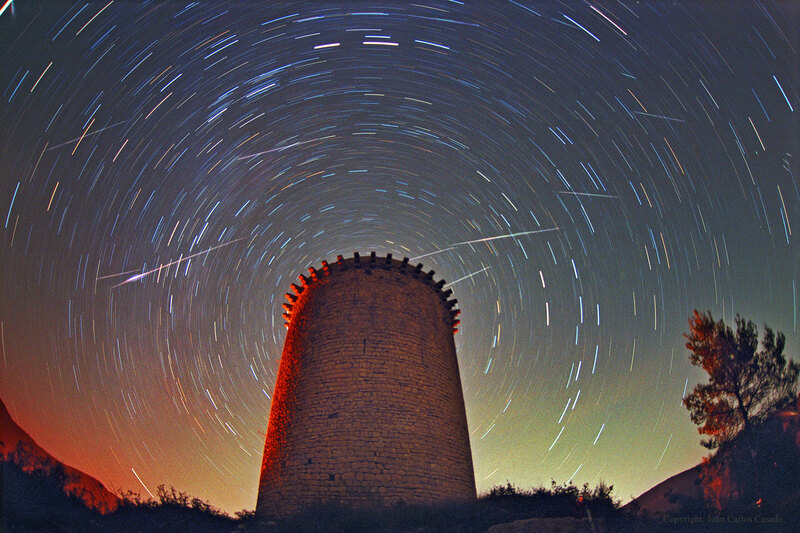 Visible are at least five Leonid meteors streaking high above the Torre de la Guaita, an observation tower used during the 12th century in Girona, Spain. In 2014, over the next few nights, the Leonids meteor shower will again peak. This year, although the crescent Moon should not create much competing skyglow, the Earth is predicted to pass through a more moderate stream of debris left over from Comet Tempel-Tuttle than in 1999, perhaps resulting in as many as 15 visible meteors per hour from dark locations.